In my last post I mentioned wanting to make a card of my own that was inspired by the cased card that I posted. Well, here it is! :) I am having fun playing with my background stamps, sponges, and cutter kit. For this one I added in an old favorite, Lovely as a Tree. I'm pretty sure that's one of the best stamp sets EVER! You can really use it for just about every occasion. I didn't put a sentiment on this one, so it will go in my stash and get one once I find myself needing a certain kind of card. I actually had to break out Chocolate Chip for this one. Believe it or not, I ran out of Early Espresso! That's my favorite color and I guess I have been using it way more than I thought lately. Do you remember the days when we all loved Chocolate Chip and thought it was the best color? Poor thing. I know here at my house it started being neglected once Early Espresso showed up. Rita, this is gorgeous! The layout, the rich colors, the accents....everything just works so perfectly together. Good thing you ran out of Early Espresso, because Chocolate Chip is perfect for this card. You have inspired me to use that stamp set today....ooohhh, thanks for the mojo! :) Hugs! 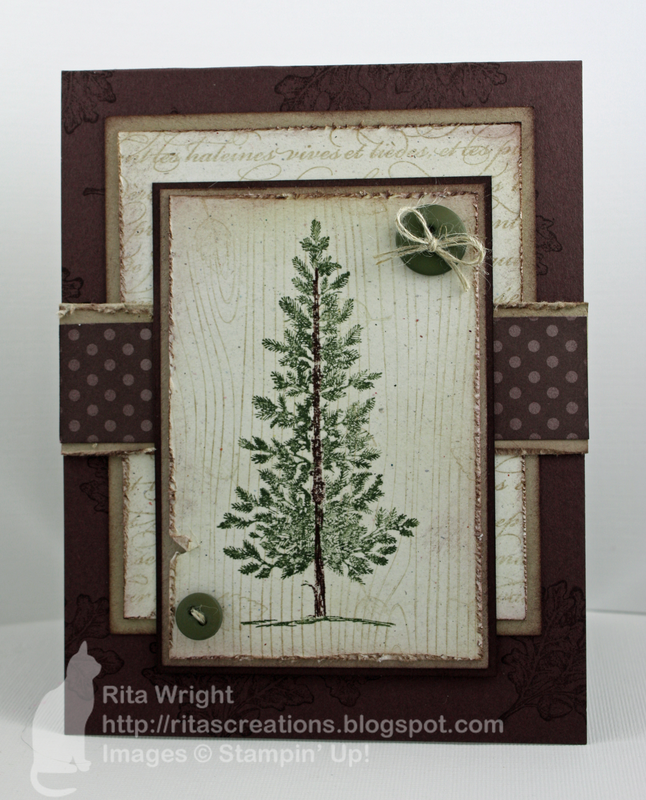 Wow Rita, this card is stunningly beautiful! I love it! 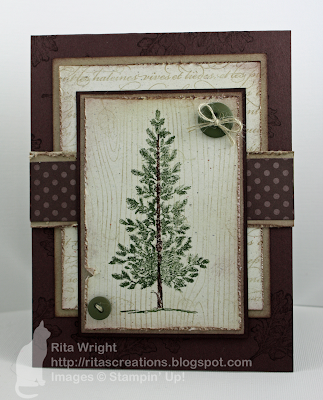 The tree looks fabulous and I love your distressing and the woodgrain background with it. Great card! Holy moly Rita, I LOVE this!! Absolutely gorgeous and like you said, perfect for just about any occasion! Wow, this is fabulous! You have combined everything to make one super card....perfection! Rita, my friend, look at you using Artichoke...voluntarily! This is simply beautiful. I am with you on the Chocolate Chip. Might need to pull it out based on this!